Discover how to adjust, sharpen and use a scythe. To book speak to Andrea at Caring for God’s Acre on 01588 673041 or andrea@cfga.org.uk. Austrian scythes available to use but if you have your own scythe feel free to bring it along. Swifts nest under the eaves of St Etheldreda’s Church Horley. Swift numbers in Britain have decreased by up to 40% in the last 20 years. There are several likely reasons for this, but one is the loss of nest sites. Swifts return to the same nest hole every year, and so when buildings need repair or are demolished, nest sites can be lost. Also, almost without exception modern buildings do not have the gaps and crevices which are essential for Swifts to nest. So largely it is older, less well-sealed buildings with a few gaps under the eaves or tiles or in the pointing, which are favoured by Swifts – like some of our churches. We are trying to encourage people to notice Swifts and where they are nesting. If local people know where the nest sites are, it’s easier to look after them, and to encourage Swift-friendly building work. This is as relevant to churches as to other buildings, because churches are still important nesting places for Swifts. There are at least 10 churches in the Cherwell District which have nesting Swifts. Swifts nesting in a church can easily go unnoticed. Parties of screaming Swifts may be obvious, but they are extremely adept at entering their nest holes; add the facts that nests are not visible from the outside and that Swifts leave no mess, and it’s not surprising that the nests are often overlooked. There are several ways in which parishioners, PCCs and church authorities can help. One is by being alert to the possibility that Swifts may be using the church for nesting. Screaming parties of Swifts seen regularly near the church, are an indication that they are nesting in the building or very close by. In the period when Swifts are actually nesting, the nest hole it is illegal to disturb it. The same applies to all birds. At other times the ideal solution is to leave the particular space alone if at all possible. If this cannot be done, advice should be obtained about Swift-friendly building work and about providing alternatives (see below*). Also if Swifts are found to be using the church for nesting or if screaming parties are seen nearby, it may be possible to install a nest box behind the louvred windows in the tower. This would need the support of the PCC and approval from the Diocese, but it is relatively cheap and simple to do, and it does not involve drilling into the masonry. It has been successfully done in several churches in Cambridgeshire and local churches in Oxfordshire are now following their example. The team with nest boxes for St Martin’s Church Bladon. A couple of weeks back I spent a Saturday afternoon with forty other people of all ages in the beauty of Wytham Woods. It was the first gathering of the Oxford Forest Church group, and we’d come together to explore nature and connect with God. On that clear crisp afternoon we spent time both together and alone, with space to be and to breathe in the woods. Amongst the fallen leaves we reflected on the coming darkness of advent. Our surroundings gave us much to reflect on. From the way the leaves were being shed so that the tree can survive the winter; to the way those same leaves provide essential nourishment, protection and darkness for the tiny seeds from the tree to find life in the spring. Research has started to attribute certain health and behavioural issues, at least in part, to a growing absence of time in nature. John Muir, the Scottish-born American naturalist, is credited with saying, “I’d rather be in the mountains thinking of God, than in church thinking about the mountains.” And for many of us time outside enjoying nature is good for our souls, as well as our minds and bodies. Wonder and awe are important sources of our spiritual growth, and such transcendent moments, when we feel deeply connected to something bigger than ourselves, often occur in nature. This nature connection can also have a positive impact on wider environmental issues – after all we don’t protect what we don’t care about, and you don’t tend to care about what you’ve never experienced. That afternoon in the woods was a chance for us to mindfully engage with nature and prepare for the darkest part of the year, and the busyness of the pre-Christmas rush. It was food for the journey, engaging us spiritually in fresh ways. Of course none of this is new or restricted to the concept of Forest Church – it draws on much older traditions when sacred places and practices were outside, and it is just one expression of perhaps a wider thirst for a deeper connection with nature and something bigger than ourselves. * But it could be part of what we need to be physically, mentally and spiritually healthy – as well as respond well to the signs of our times. As we embraced the falling darkness in the woods at Wytham we reflected on what we wanted to take into this time of advent. Like the tiny seeds beneath the fallen leaves all around us, it might be little and fragile – but making space to participate with nature this advent may be just what we need for mind, body and soul, and enable us to hear the familiar story in a fresh way. * Nor, for that matter, is it restricted to Oxford – groups are springing up all over the country – see www.forestchurch.co.uk. Serious issues about the environment seem to be in the news on a regular basis. This combined with the lack of progress on international climate change negotiations, have led many people with environmental concerns to lose hope. Three years ago Margot Hodson and Ruth Valerio met up and realised that their hope was also running a little thin. As speakers, their hope had become less proximate and more eschatological. In other words it had changed from “we can fix it” to “it will all work out OK in the end”. Thus began the “Environment and Hope” project. They first gathered a small group of theologians, scientists and activists in Oxford in October 2011 to thrash out some ideas. In May 2012, they held a much larger meeting called “Communicating Hope” at High Leigh Conference Centre, with 60 people, many of whom are involved in communicating the news about climate change and other environmental problems to Christian audiences. The keynote speakers included theologian Richard Bauckham, and Andy Atkins, the Executive Director of Friends of the Earth. We then needed to publish all this material, and it was Richard Bauckham who suggested that it could go into a special issue of Anvil, the theological journal. Margot R. Hodson: Editorial: Discovering a Robust Hope for Life on a Fragile Planet. Martin J. Hodson: Losing Hope? The Environmental Crisis Today. John Weaver: Exploring Hope. Richard Bauckham: Ecological Hope in Crisis? Andy Atkins: Communicating Hope in the Real World. Bishop Geoff Davies: Southern African Faith Communities’ Environment Institute (SAFCEI). Last week, after a final round of negotiations, Working Group I of the Intergovernmental Panel on Climate Change (IPCC) released the “Summary for Policy Makers” of its report on the scienctific basis for climate change (full summary; headline statements). “Human influence has been detected in warming of the atmosphere and the ocean, in changes in the global water cycle, in reductions in snow and ice, in global mean sea level rise, and in changes in some climate extremes. This evidence for human influence has grown since AR4 [the last report, published in 2007]. It is extremely likely [= 95 to 100%] that human influence has been the dominant cause of the observed warming since the mid-20th century. Looking to the future, the report offers four emissions scenarios, representing possible concentrations of carbon dioxide by 2100. Current concentrations breached 400 ppm in 2013, up roughly 80 ppm in 55 years. The most optimistic scenario, which would require significant cuts in emissions, places 2100 concentrations at 421 ppm. The remaining scenarios place it at 538 ppm, 670 ppm, and 936 ppm by the year 2100. Under all but the first of the emissions scenarios, “Global surface temperature change for the end of the 21st century is likely to exceed 1.5°C relative to 1850 to 1900”; it is likely to exceed 2°C for the two highest emissions scenarios and more likely than not to exceed 2°C for the second lowest. Warming will continue beyond 2100 under all scenarios except the lowest. Sea level rises of between .25m and .63m (about 1 to 2.4 feet) over and beyond the level from 1986 – 2005 are predicted by the end of the century (the worst-case emissions scenario would offer a higher rise), and seas will further acidify. Heat will also affect ocean circulation. in thanksgiving for the God-given intellectual gifts that have enabled scientists to understand the natural world and our impacts on it. Give thanks for the many scientists involved in writing and reviewing the IPCC report and for the truly global reach of their research. that this discussion will be informed by godly values and will aim to work out ways of j living within the capacities of creation that will be joyful, sustainable and equitable. At present the risk is that those who have contributed least to emissions will be left to deal relatively unaided with the worst of the impacts. Pray for climate justice. that discussion will lead to action and to genuine change at all levels. Give thanks for recent moves in the US to reduce coal plant pollution. we will live our lives in ways that express thanksgiving for God’s gifts and are determined by love of God and neighbour. we will learn contentment and challenge the prevalent materialism that leads to overconsumption and to exploitation of both people and planet. Further Reading: The excellent Guardian blog of the report’s release and responses to it, CAFOD/CARITAS responses; What does the IPCC report mean for businesses and investors? (Guardian); Reporting from “Dot Earth” blog with a focus on gaps between science and policy (New York Times), Le Monde (which suggests IPCC may be too conservative), Wall Street Journal (good summary, and significant as the paper has been historically fairly cautious), Times of India, Nature. 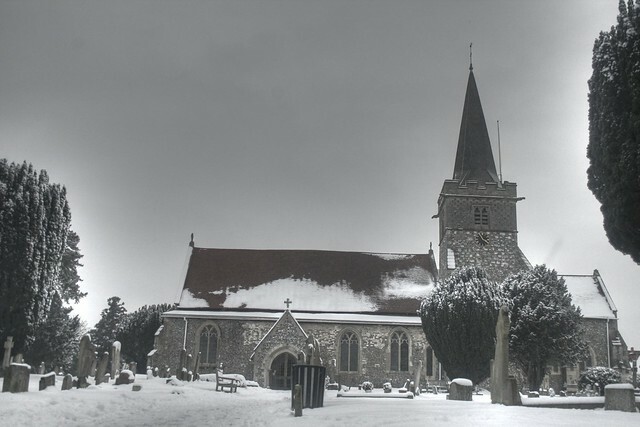 Does your church struggle to keep the heat in your building during the chilly winter months? Would you like the building to be warmer, more welcoming AND cost less money to run? The Diocese of Oxford and the Trust for Oxfordshire’s Environment (TOE2) have developed a grant scheme to provide churches with expert energy efficiency advice tailored to their building, aiming to help PCCs to save money and run buildings more sustainably. The scheme is restricted to 24 churches in Oxfordshire, and churches are invited to apply for the first round of the grant scheme by the end of October 2013. “This scheme is such good news! Increasing energy efficiency in church buildings can seem a daunting project. We need to juggle the different comfort levels for a variety of users with the historic nature of our buildings, whilst keeping costs down. The scheme is adminstered by TOE2. To apply complete the application form and return it to Fiona Danks at TOE2. For further information contact Fiona Danks at TOE2 on 01865 883488 (Wed and Thurs only), email toe@oxonrcc.org.uk or visit www.trustforoxfordshire.org.uk. To discuss audit options for churches outside Oxon contact Matt Freer, the Diocesan Environment Officer. The scheme will provide a grant towards the cost of an energy audit that will be carried out by qualified staff from Sustain (www.sustain.co.uk), who will make a site visit and then write a report with detailed recommendations of ways to improve energy efficiency and reduce costs. Sustain is a carbon reduction company which advises on practical ways to reduce energy and carbon emissions. They have extensive experience of carrying out energy audits on a wide range of buildings and have particular experience of working with listed buildings and historic places of worship. Sustain will work with the DAC to ensure recommendations are in line with current guidelines. The total cost of each audit is £660. The available grant is £540 – and so the church is asked to provide the balance of £120. In the case of very small churches (Electoral Roll below 30) an additional subsidy will be given by the Diocese of Oxford to halve the cost (ie the church only pay £60). Following an audit, churches may apply to TOE2 for a grant of up to £5,000 to support any of the recommended improvement works. This grant scheme has been made possible thanks to the support of: the Patsy Wood Trust, the Beatrice Laing Trust and Charlie Laing.